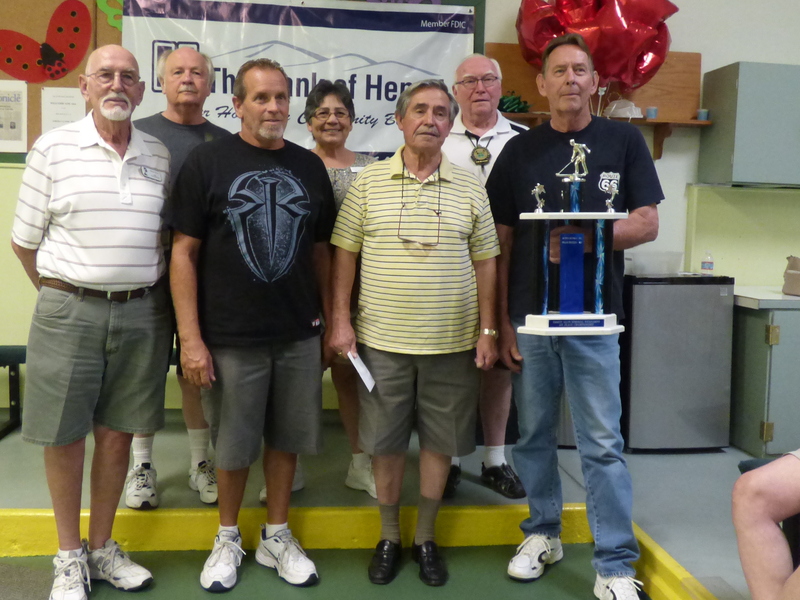 Memorial Venue Hosts Acclaimed Tournament by Dean Grattidge District 7 Reporter For the third year the Seven Hills Resort proved to be a venue for the much-anticipated Emmett Allen Memorial Shuffleboard Tournament. This event took place from June 29th to July 2nd, 2015, with 72 players on deck. We were privileged to have The Bank of Hemet as a financial backer as well as the fees paid by players. The site, now designated the “Emmett Allen Memorial Shuffleboard Court” was endorsed by the contestants. The games were 12-frame, played under CSA rules. The event brought out he best from senior and new players, alike. Numerous volunteers contributed to the success of these District 7 early summer games. ATM’s were Sharyn DiChiro and Helen Noeltner who also created and maintained the charts. Club president Suzanne Shapiro was constantly on hand as facility director. Head ref was George Hayner while Karla Winget supervised the collection and accuracy of the score cards. A board crew, maintaining the integrity of the courts was made up of Ron Needham, Chuck Davis, Everett Harbison and Minda Needham. We thank all, along with Jerrie Stutes and Donalee Allen for canvassing the neighborhood merchants for many exciting door-prize gift certificates. We also thank Polly English for fashioning a fine payoff from tickets sold on the Lei cash drawing. Kudos to Len Sweet for construction of the Hawaiian Lei. Suzanne Shapiro an Mary Davis persevered in “setting the table” and offering many outstanding lunches for each of the 4 days. Local businesses contributing to the door prizes were: Farmer Boys, Dicky’s Barbecue,, Walmart. I-Hop, Sweet Baby Jane’s Barbecue, Stater Brothers, La Fogata Mexican Restaurant and Marie Callender’s. In pursuit of excellence, these 8 winners of pins and cash awards have etched their names Into the record books — Championship round: First place, Harry Gregory, a rookie from El Grande Estates, with his first championship, second place, Tom Armijo (Sun City), third place, Bruce Kiefert (Golden Village Palms) in his first tournament win, fourth place, Jay Davidson (Hemet West). It is incorrectly reported that Harry Gregory is from district 5, he is from District 7 here in Hemet and this is his first year playing Shuffleboard.